The Full Text Finder / Journal Holdings list is a catalog of all the journals to which Logan patrons have access. Locate journals by title. Enter the journal title into the search box. View the results list for your title. Any access points and full text coverage will be listed below the title. If "paper collection" is listed, that means we have that title in paper format in the library. 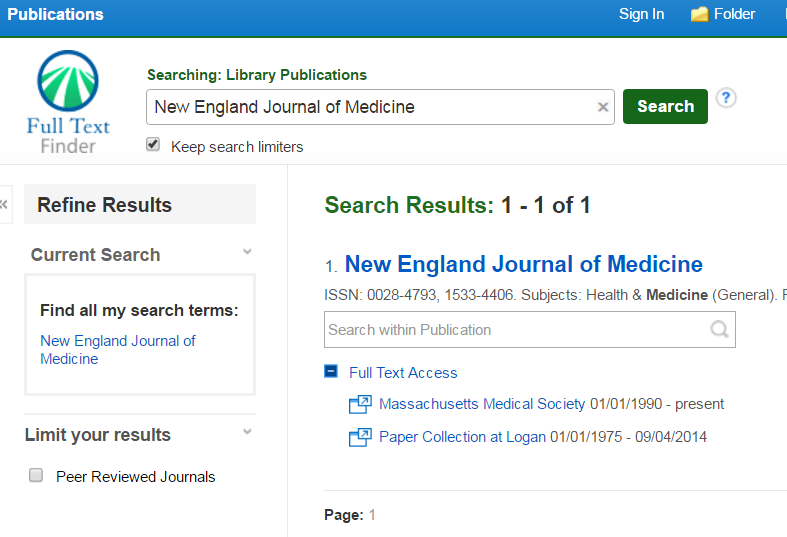 For this journal, New England Journal of Medicine, we have online access through the Massachusetts Medical Society (publisher) from 1990 to the present. Click that link to access the journal full text online. We also have this title in paper format in the library from 1975 to September 2014.